Summers that shape a lifetime. Simple. Unplugged. Close to Nature. Matt is from New York City and he returns as our rowing instructor this summer. He is a sophomore at McGill University. Matt teaches the fundamentals of rowing, preparing boys for trips like The Great Pond Rowing Trip as well as the more advanced trip, ONG-BAK – O.A.R. Navigators Going Backward Along the Kennebec. Matt is also a talented and versatile musician and we’re fortunate that he shares his skills with us for nightly campfire entertainment and Saturday Night Shows. This will be Matt’s 8th summer at Pine Island. This entry was posted in Pine Island Staff on April 10, 2019 by Pine Island Camp. The first known ascent of New Hampshire’s Mt. Washington was in 1642 by Darby Field. He summited the Northeast’s highest peak to prove that Abenaki gods did not live on top of the mountain. Pine Island’s own Sarah Hunter, along with her husband Jason and their sons, long-time Pine Islanders Caleb and Silas, made the trek up Mt. Washington last spring, but with a far different goal in mind. In September of 1998, Sarah was asked to join a friend on a mission to summit Mt. Hale in the White Mountains. Cold rain and a tree-covered summit did not inspire Sarah to continue hiking in the Whites. The only reason she was on the proverbial dull peak was to help her friend toward her goal of hiking the 48 4,000-foot peaks in the White Mountains. Caleb Hunter’s first summer at PIC was in 2014 and Silas arrived the following year. Both proved to be “tripping fools,” spending large chunks of the summer out on trips, hiking trips in particular. They returned home with spectacular tales of time on the trail and a newfound passion. With both boys at camp, Sarah and Jason decided to see if they could handle the tortuous White Mountains. Sarah immediately caught the hiking bug. The following winter she began bagging peaks in the snow, ice, and cold. We can only presume that this is because she found hiking in the summer to be too easy. As her list of summited peaks grew, Sarah realized that she could hike all 48 of the 4,000-foot peaks in the Whites. The pursuit would bring her to mountains off the beaten path and push her to hike when the weather was less than perfect. 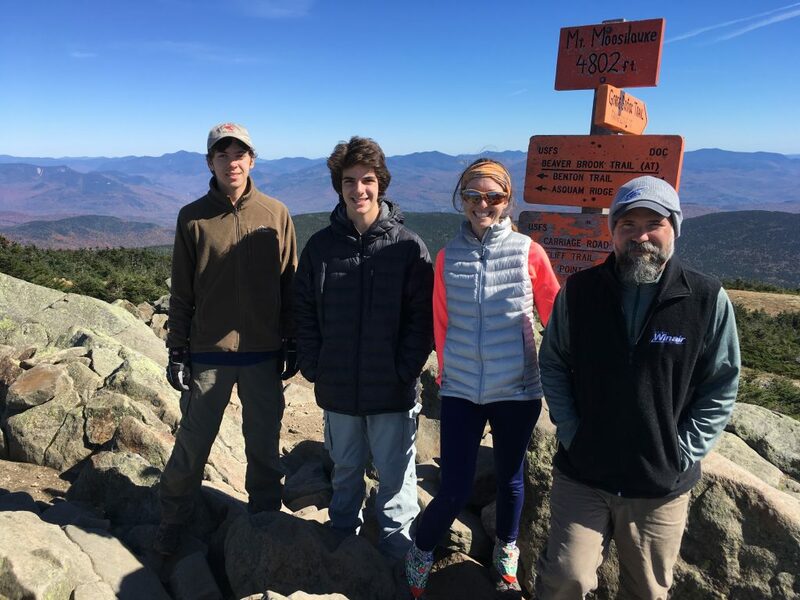 This past spring, on Father’s Day weekend, Sarah, Jason, Caleb, and Silas pushed to the summit of Mt. Washington, Sarah’s 48th summit, and Sarah became a member of the exclusive 4K Club. Sarah has not retired from hiking. She continues to help friends and family in their quests to become 4K Club members, sometimes re-climbing 4,000-footers she has already summited – Sarah has hiked Eisenhower five times! Sarah is also attempting to complete her New England 67 – a compilation of all the 4,000-foot mountains in New England. She has bagged 58, and by press time she should have 59 after her trip to Baxter State Park to summit North Brother on January 13. Both Silas and Caleb have summited nearly 40 of their 67 New England peaks, many of which they climbed on Pine Island trips. Sarah has inspired us so much that we hope to create a 48 program of our own, attempting to put a camper on every 4,000-foot peak in the Whites sometime soon. 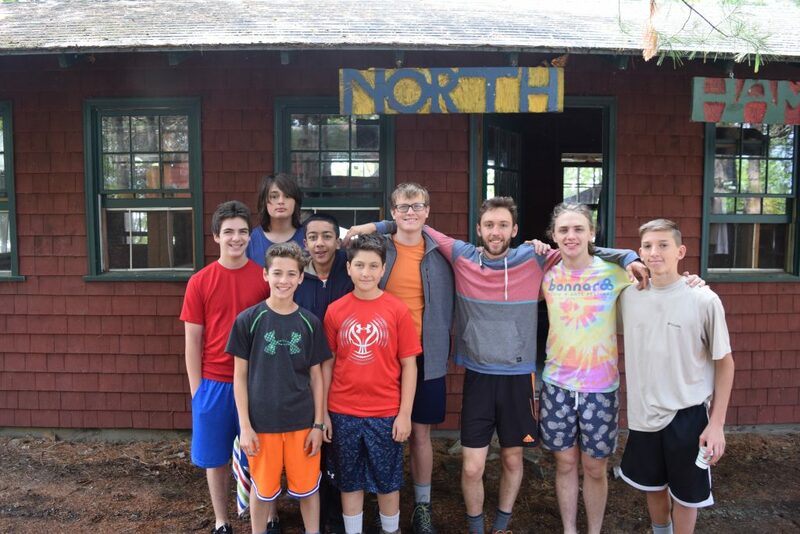 This entry was posted in Pine Island Staff, The Pine Needle on April 3, 2019 by Pine Island Camp. We are happy to announce that Noah Brodsky and Walker McDonald have signed on to lead Expedition Camp this summer. Noah is a junior at Colorado College from New York City. He spent five summers as a camper and later returned to teach rowing for several years. Last year Noah joined the last few days of the expedition camp hike to fill in for injured leader Cole Gibson. Sumner immediately sought out Noah after learning about Cole’s injury. “You like to hike, right?” Moments later Noah was packed and in the van, heading to Vermont’s Long Trail. He quickly won over the hearts of the expedition campers by hiking in with an apple pie. Noah Brodsky, 3rd from the right. Walker is a junior at Clemson University from Columbia, South Carolina. He joined a long list of South Carolinian Pine Islanders three years ago when he signed on as woodshop instructor. It was Joe Kovaz who recognized Walker, his physics and chemistry student, as a potential Pine Islander. Joe was right. Walker represents the continued growth of the Monte Ball legacy of southern staff. Walker McDonald, 2nd from the left. Both Noah and Walker have traveled many miles of trails and waterways in Maine and New Hampshire and they have a combined 14 years experience at Pine Island. They are also both Wilderness First Responders. 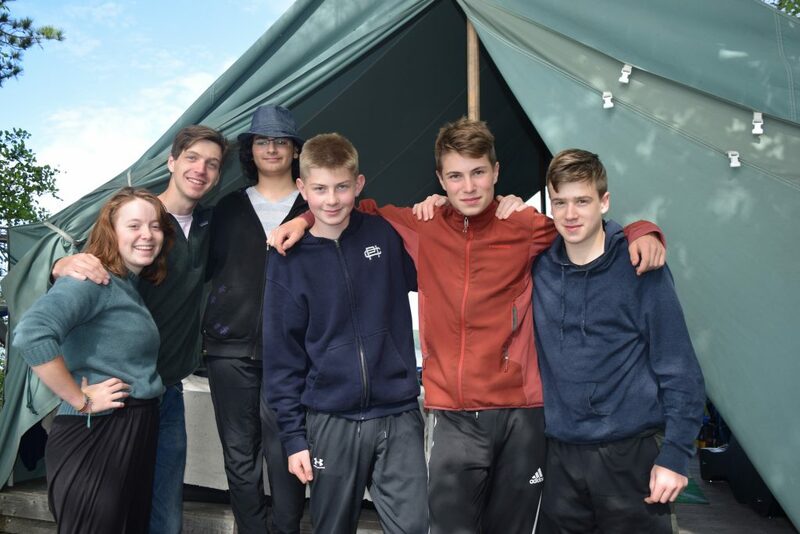 Together they will provide guidance to our 10 expedition campers as they train and prepare for – and ultimately complete – two extended camping trips. The first adventure is a 12-day canoe trip on the Penobscot, Allagash and St. John Rivers. The second is a 12-day hike tackling the most challenging 100 miles of Vermont’s Long Trail. We’re grateful to have Noah and Walker return as our expedition camp directors. This entry was posted in Expedition Camp, Pine Island Staff on March 27, 2019 by Pine Island Camp. Satchel Toole is a Brunswick, ME native who spent two summers as a camper at Pine Island and several years as a counselor teaching riflery and fly-fishing. 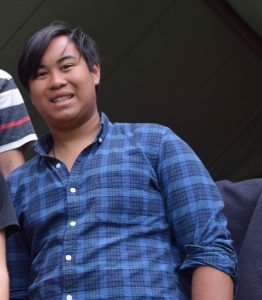 Last summer Satchel held the coveted position of Expedition Camp Leader (along with his co-leader, Cole Gibson) and this year we’re fortunate to have both Satchel and Cole return as our Assistant Directors. Satchel holds a Bachelor of the Arts in Economics and Environmental Studies and a minor in Spanish from Saint Lawrence University. He is a Wilderness First Responder. This will be Satchel’s 8th summer at Pine Island. He is the youngest of three brothers who all attended, worked, and now volunteer regularly at Pine Island. Satchel’s mother, Sandy Holland, is famous in the Pine Island community for providing delicious baked goods for our annual NYC Campfire and volunteer events. 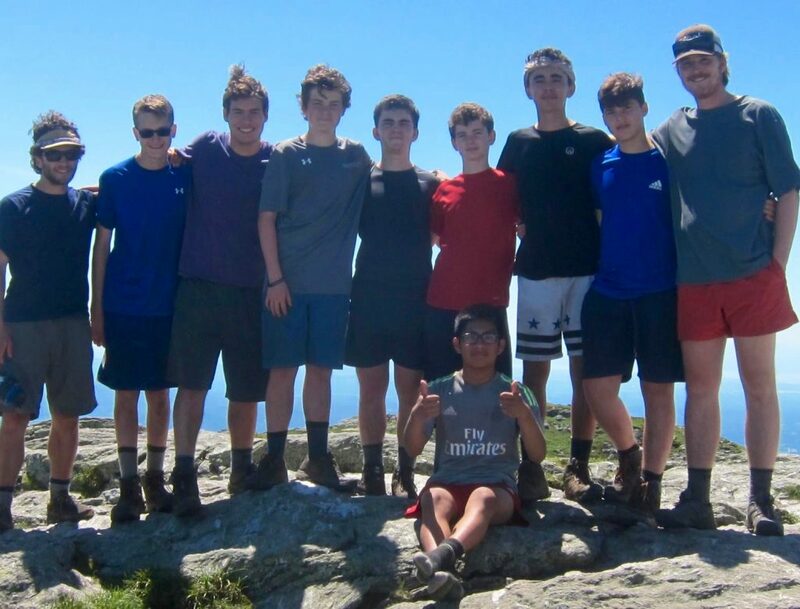 Satchel (far right) with Expedition Campers on the Long Trail. This entry was posted in Pine Island Staff on March 13, 2019 by Pine Island Camp.